This year marks the 40th anniversary of Diptyque's first fragrance, L'Eau, originally introduced in 1968. To celebrate, the line has launched a trio of unisex colognes: L'Eau de L'Eau, L'Eau des Hesperides and L'Eau de Neroli. All three were developed by perfumer Olivier Pescheux. L’Eau de L’Eau pays homage to L'Eau (go ahead, translate that in your head), which was said, in turn, to have been based on a 16th century potpourri recipe. I haven't tried L'Eau in some years; my testing notes, probably written in late 2003 or early 2004, say "it is warm and spicy but sheer at the same time: an almost aqueous feeling: potpourri under water. Very nice, would absolutely never wear it." My tastes have expanded pretty dramatically since then, so perhaps L'Eau would be more to my liking now, who knows? I like L'Eau de L'Eau just fine. It too could qualify as potpourri under water; after a nice burst of citrus, it's likewise warm and spicy but sheer at the same time. As Marina has already pointed out on Perfume Smellin' Things, it gets darker the longer it is on skin, and while it never gets heavy (if memory serves, it is much lighter on the cinnamon and clove than the original L'Eau), I'm not sure but that it might wear better in spring and fall than in high summer. Very nicely done, and the lasting power is excellent. The notes for L'Eau de L'Eau: clove, cinnamon, ginger, pink peppercorns, geranium, lavender, orange blossom, Benzoin balm, tonka bean and patchouli. L’Eau des Hesperides starts with a wonderful burst of dry orange (the notes: bitter orange, mandarin, lemon, petitgrain, red thyme, rosemary, mint, cedar, white musk). As it develops, the orange is joined by a generous handful of chopped herbs. This could be the lighter, fresher (and drier) homage to Diptyque Oyédo, and on a spring day like today, I can't imagine why I'd want such a thing, but I've only to read my own review of Oyédo to remember that in the heat of summer, Oyédo's fizzy sweetness can be a bit much. L’Eau des Hesperides does have a nice bite, and is very much worth a try, especially if you found Oyédo more than you were willing to take on even in cooler weather. L’Eau de Neroli is the "classic cologne" entry in the trio (notes: bergamot, petitgrain, verbena, tarragon, neroli, orange blossom, geranium, beeswax, white musk and cedar). It is a sunny and cheerful citrus, very bright, very wearable, with first the tarragon, and later the beeswax, adding some interest. If I can't think of much to say about it, it is only because a sunny and cheerful citrus is not so very hard to find, but if you're in the market for a summer cologne, this one is worth a shot. For my money, I like a hefty dose of oakmoss in my summer cologne so I'll stick with my Eau de Guerlain until they get around to de-oakmoss-ing it, assuming they haven't already done so. I wasn't particularly excited when I first heard about this trio, but they've done a lovely job, and the packaging, as always with Diptyque, is superb. I wish they'd done a little coffret like this one, but ah well. 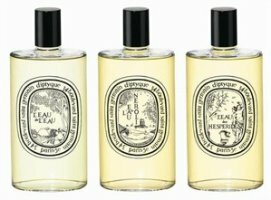 I'd also be happier if I hadn't recently heard the rumors that Diptyque is axing a rather substantial proportion of their more interesting fragrances (reportedly L'Eau Trois, Virgilio, L’Autre, Eau d’Elide, and Opôné are all goners) — if it turns out to be true, then somehow this trio doesn't seem to have enough "weight" to make up for the loss. Diptyque L'Eau de L'Eau, L'Eau des Hesperides & L'Eau de Neroli are available in 200 ml Eau de Cologne, packaged in splash bottles with optional pump spray; $150 each. For buying information, see the listing for Diptyque under Perfume Houses. I really liked the l'eau de l'Eau, but the size of the bottle was seriously offputting. I can hardly hold a bottle that size. It is hard to understand why all the brands are doing these massive bottles, esp. when they're doing multi-scent releases. But can only assume people buy them or they wouldn't make them? But I'd like them in 15 ml, of course. I've never had a chance to try any of the Diptyques. Somehow they do not really appeal to me. None of the Diptyque's being axed are on my “to try” list, thank goodness. I can't imagine the wails if Philosykos…. I won't even go there. I've been meaning to try Oyedo, but Hesperides sounds as if I'd like it better. Which would you choose between it and one of the Aqua Allegorias? Overall, none of these three excited me enough to want to try them very much… and they're all only available in 200ml??! What the…? Are they LEs? I LOVE Oyedo! It's a bit….bracing!..but a snappy little fragrance. I would definitely choose it over any of the AAs only because I think it's more interesting. I can't speak to Hesperides, alas. But Oyedo is interesting and crisp and fun and I love it! Just my two cents – Hope this helps a little bit. Oh no! Not my Eau d'Elide! Joe, they kept their absolute best (Philoskyos, L'Ombre, Olene, Tam Dao, Oyedo) but also their absolute worst (Lierre) and a couple that I would consider nice, but “slight” (Ofresia, Do Son). If it's true that all of those are gone, it sort of changes the aura of the line, youknow what I mean? I would at least try Oyedo, it's a cool scent, but Hesperides might be more “wearable”. That would be a hard choice. L'Eau de L'Eau is arguably the best of the 3, but it's the least “me”, and my next favorite is the Hesperides, but I already own Oyedo so don't feel the need for it. So, I'd take the Guerlain Laurier. A “snappy little fragrance” is a perfect description. Also loved what Luca Turin wrote in Perfumes: The Guide: “Is it a perfume? No idea. Can it be worn? I'll give it my best shot. One thing for sure: it's brilliant”. Isn't it a shame? So far as I know, it is still a rumor — so wouldn't try to corner the market until you confirm w/ Diptyque. In that case I will phone Diptyque and ask them for some samples I'm curious now. No, not Virgilio. Diptyque why hast thou forsaken me? I guess I should budget a bottle against the possiblity. Robin: I bought a brand new bottle of Eau de Guerlain in April. I sprayed it alongside the dregs of my old bottle and the scent was the same. It might have been old stock, so your mileage may vary. I have a nice big decant of Virgilio, and will have to make it last. Very glad to hear that about EdG, although of course you're right it might be old. I'll have to hope I find an old one too. I've always liked the Diptyque line. Philosykos, Tam Dao and Oyedo are my faves – in that order. I've never even sniffed the one's that are being axed, so I'll never know what I'm missing I guess. I find Philosykos so similar to L'Artisan Premier Figuier that I can hardly tell them apart (oh, but one must buy the L'A EXTREME otherwise it simply vanishes) L'A is the award winning frag but I think for the money Philosykos is just as wonderful. I find Philosykos much woodier, and longer lasting than even the PF Extreme…but they're all wonderful! Has anyone layered Oyedo with another scent to successfully calm the mint down? The minty explosion is overpowering anything else in it for me. Too much! I have not, but I do think of Diptyque L’Eau des Hesperides as a “calmer” variation on Oyedo.